Close your eyes. Are you feeling this architectural space? Pablo Casals-Aguirre's intimate narration about the Library for the Blind and Visually Impaired in the Ciudad de los Libros (Plaza de la Ciudadela, Mexico City) perfectly outlines the main idea of the design to house not only blind people, but the community at large. 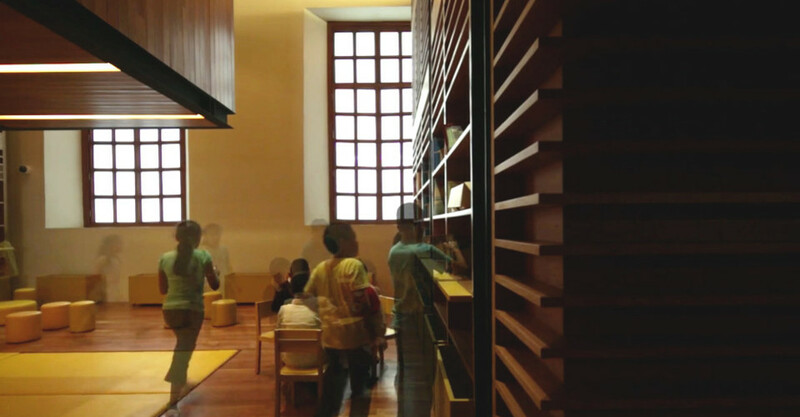 The short film on the "Biblioteca para Ciegos y Débiles Visuales" mostly focuses on the interior spaces of the building designed by Mauricio Rocha y Gabriela Carrillo (Taller de Arquitectura). The camera lingers on the perception of the different subtle sounds that characterizes the users' everyday routine. The visual exploration is partly eclipsed and blurred in order to focus on the acoustic comprehension of spaces by means of a continuous and wise combination of out of focus perspectives and black frames. The short film also narrates how the project is conceived to enhance spatial perception through the use of the five senses by means of varying light intensity and weight of materials (concrete, bricks, steel and glass), while horizontal and vertical lines in the concrete offer tactile clues to identify each room. Conceived as part of a program by the Mexico City government to provide services to the district of Iztapalapa - one of the most disadvantaged areas of the city and the one with the largest visually impaired population in the Mexican capital - , the project became a benchmark for the life of the community and gained the Medalla de Plata, categoría Diseño de Interiores during the XIII Bienal Nacional de Arquitectura Mexicana (2014).